I hope you have enjoyed the summer and had quality time to spend with your kids. At Liberty, we have been busy preparing for the new school year. At Liberty, we are making changes and trying to always grow and improve. Over the past few years, we have embarked on a change to how we do business with regard to fundraising and parent requests. In our attempt to get away from what seemed like constant fundraising and a Wednesday Note filled with requests, we changed the way the School and Foundation do business. We want our families to be focused on education and supporting their child. When we say that, we don’t want our families to think that means fundraising and supplying stuff for the school. To us, that means being active in their education. Reading with him/her at night, checking his/her homework, communicating with teachers and supporting the school in both academic and social expectations. We are lucky, overwhelmingly; our families do these activities and more. To foster that philosophy, we made some changes to how Foundation fundraises and the type and number of financial and material requests made by the school. The following is a reminder of the changes we made. · Class supply lists will be for items that students will need to complete work at home and for items students may want to customize for their desk. All items required by the class will be supplied by the school or through a special fund established by Foundation to supplement school supplies. While students may bring items like a folder that has something on it they like for their desks, they will not need to. · Classes will minimize and simplify requests for class parties and activities. The School and Foundation will work to cover as many of these costs as possible. · Foundation will focus on their three big fundraisers a year. The three are the Membership Drive, Walkathon, and a spring event or raffle (if necessary). They will continue to have passive fundraising like scrip/gift cards and Box Tops for Education but will stop the many other small fundraising programs. They will focus their energies on events that are not fundraising opportunities but community building activities like Family Fun Night, Holiday Shop and the Pasta Dinner. · Two of our upper grade classes, 4th and 6th, have an overnight field trip built into their curriculum. Each of these has expenses connected to it. Going forward, upper grade field trip costs will be split between parents, Foundation and Liberty School. In 6th grade, parents can choose to do Friday pizza as their fundraiser to collect their share of the cost or they can choose to skip fundraising and just pay the fee themselves. In 4th grade, the parents can participate in the traditional recycling program and take on the bake sales if they choose. These changes have been an attempt to refocus on the mission of being a school and community and less of a fundraising venture. Foundation has taken on some new responsibilities in this plan and we hope that everyone considers this when making their commitments to the fundraisers they do hold. If you have any thoughts or questions about these changes, please feel free to contact members of the Foundation board or me. Whenever possible, we will post our notes online rather then send them home with our students. For example, the Wednesday Note will be available every Wednesday on our district website. Teachers will post class notes, field trip slips, homework assignments and many other items that will inform you and keep us all organized. If you don’t have access to the Internet or just prefer to have us send a copy home, we will be happy to provide that to you. Historically, enclosed with this packet would be the Liberty School Parent and Student Information Handbook. We are asking our parents to use our district website, libertysd.org to access the important information that is contained in this book. The information contained in our handbook is quite comprehensive and contains many important items that you will want to refer to during the year. Please take the time to read it carefully, as you will find some new information and it will probably address many of your questions about the school. There are an assortment of forms and information sheets for you to read over and complete. You can see why we are sending these out before school begins. Please complete and return the forms no later than the first day of school. 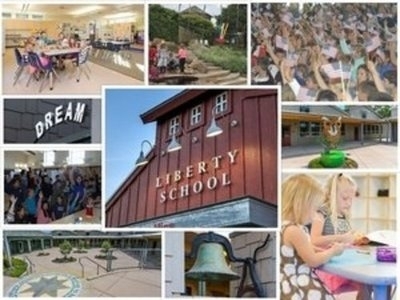 You can go to the libertysd.org website and click on the Back to School Packet link to be forwarded to many of our forms. Please fill out the forms, print and return the forms as you would the traditional forms. Student Emergency Form – A separate card is necessary for each child. Please include at least three emergency phone numbers. If your child has some critical needs, please indicate this at the top of the front of the card. Also attached are the 2018-19 school calendar and our list of important dates for the year. All of those dates can be found on our district website libertysd.org. Please note that our Back to School Night is scheduled for August 29th. This night is for parents only. There are many reasons that we ask you to make every effort to have your child at school everyday and on time. Most importantly, students will do better in school and feel a part of our school community if they are here daily. Of course, if a child is ill, then he/she needs to be home. But it is very helpful and important that you arrange appointments for after school and take vacations during our school vacations. Your help with this is greatly appreciated. For unavoidable absences that exceed 3 days an Independent Study Plan can be obtained in advance and completed during the absence. Please send your child with an absence note when he/she returns to school after being absent. School begins at 8:15 everyday. It is very important that students are here on time and ready to begin the day with the rest of their class. Milk will be available for $.40 per day by the day, week, month, or year. If you are sure your child wants and will drink milk, please send the correct change in an envelope clearly marked “milk” with the child and the teacher name. Lunches are also available for $3.75 per lunch. Because additions and changes happen with student enrollment up until school begins, we will not finalize our class configurations for our primary classes until right before school begins. If your child will be in Kindergarten, 1st, 2nd or 3rd, a list of classroom assignments will be posted in the office window at 4:00 p.m. on Tuesday, August 21st. The Liberty School Foundation will be hosting a Welcome Back Coffee reception beginning at 8:15 a.m. on August 22nd. Please come by after you drop your child at their class. It will be a wonderful opportunity to hear about upcoming events planned by the Foundation and learn how you can be involved and support your child’s education. I look forward to seeing everyone on August 22nd.